5. Review and comment on the Main Street Business Improvement Association’s request to extend outdoor dining leases with private businesses to parklets. “Parklets” (transforming small urban spaces such as on-street parking stalls) into public space and/or landscaping) has become increasingly common across America, but has not yet been authorized in Santa Monica. In response to a specific request by the Main Street Business Improvement Association, a Request for Applications was issued for two or more parklets on Main Street as part of a pilot project. The pilot would be a public experiment with the Main Street community to temporarily test this new concept in the public realm. The parklet pilot is intended to test and evaluate the program for at least one year, but may end earlier if public safety issues arise. Staff is recommending that Council approve two locations for parklets to be operated by Holy Guacamole, LLC and One Red, LLC (dba Wild Flour also Ashland HiIl). The term parklet was first used in San Francisco to describe the conversion of an automobile parking space into a mini-park for public use. On November 16, 2005, Rebar Group, an art and design studio based in San Francisco, paid for two hours’ worth of time at a parking meter in the South of Market District of San Francisco and laid out sod, a planter, and a bench in the parking space. After the meter expired, they removed the items and vacated the parking spaces. The image of the temporary park was shared extensively through social media, and Rebar received requests to create their project in other cities. Instead of allowing their installation to be replicated exactly, Rebar created a how-to manual so that people could create their own without the active participation of Rebar. Following are pictures of the original pedestrian space created by Rebar from metered parking spaces. What resulted from the temporary space created by Rebar is “PARK(ing) Day”, an annual event where individuals temporarily transform metered parking spaces into “PARK(ing)” spaces. According to the PARKing day website, the mission of PARKing day “is to call attention to the need for more urban open space, to generate critical debate around how public space is created and allocated, and to improve the quality of urban human habitat … at least until the meter runs out!” These types of temporary parklets are commonly referred to as “Pop Up Parklets” and do not meet the same standards as parklets that will be discussed in this report and that are installed for longer term use. “Pop-up parklets” are generally installed for a portion of a day, while “parklets” are installed for years, even though both forms of parklets are very often referred to as “temporary”. Parklets are typically administered through partnerships with adjacent businesses and/or surrounding residents. Partners maintain the parklet, keeping it free of trash and debris. Where no local partners are present, a parklet could be installed and managed by the city as a traditional park or public space. The National Association of Transportation Officials (NACTO) defines parklets as “public seating platforms that convert curbside parking spaces into vibrant community spaces.” Parklets typically have distinctive designs that incorporates seating, greenery, and/or bike racks and accommodate unmet demand for public space on neighborhood retail streets or commercial areas. However, in San Francisco one parklet is installed in a residential neighborhood and sponsored by a home owner. The parklet is installed directly in front of the home and blocks the homes driveway. The picture to the right shows the parklet during construction. Parklets are typically applied where narrow or congested sidewalks prevent the installation of traditional sidewalk cafes, or where local property owners or residents see a need to expand the seating capacity and public space on a given street. Parklet operators typically enter into an agreement with the local jurisdiction, in some cases through an application process, procuring curbside seating in place of one or more parking spaces. · A great majority of complaints refer to a lack of maintenance and stewardship of parklets, for example: litter or garbage build-up, graffiti, unattended repairs to wear and tear, or poorly maintained plants. · Neighbors also complain when restaurants or cafes are seen providing table service at parklets. Following the first installation of a parklet in San Francisco in 2010 on Divisidero Street (more information on the Divisidero pilot is provided later in this report), other cities have begun to implement parklet programs. Los Angeles implemented a program in September 2011 when City Council directed the Planning, Transportation, and Public Works Departments to work together to implement construction of parklet pilots. Other cities which have implemented parklets include Oakland, Berkeley, Phoenix, Long Beach, Portland, Seattle, and San Diego. · “People Spots” – (i.e. parklet) Temporary platforms adjacent to sidewalks usually within existing parking lanes to create seasonal space for outdoor seating and dining. Due to weather conditions in winter, parklets operate only from May to November. During winter parklets are removed. · “People Streets” – Conversion of excess asphalt/concrete spaces (e.g. cul-de-sacs, dead end streets) into hardscape public spaces with paint and street furniture. · “People Alleys” – use of alleys for artwalks, seating, and other events that can activate these spaces for uses to support placemaking and economic development. · “People Plazas” – Activation of existing malls and plazas through programming and retail opportunities with public and private partners. Each Pavement to Parks project is intended to be a public laboratory for the City to work with local communities to test new ideas in the public realm. Materials and design interventions are meant to be temporary and easily reversible, should the trial run demonstrate the need for design changes. After testing their performance, some spaces are reclaimed permanently as public open spaces. Seating, landscaping, and paving treatments are common features of all projects. In 2010 San Francisco initiated a pilot on Divisidero Street, a commercial corridor, between Grove and Hayes Streets. Divisidero is a neighborhood-oriented retail street, with some city- and region-wide draw. The area businesses include cafes and restaurants as well as retail. The street is active during the day and night and is served by 24 hour bus service. A trial parklet was installed in conjunction with the Divisadero Streescape Improvement Project, with new bus bulb-outs, median widening with trees, landscaping, and lighting fixture upgrades. Below is a rendering of the parklet when it was being conceptualized as well as a picture of the parklet after being installed. The parklet was sponsored by a business that was both a bicycle store and café serving light fare and beverages including alcohol. The café provides daily maintenance of the parklet, but all seating and bike parking is free and open to the public. Alcohol is not allowed on the parklet. · The study found that the number of times people visited the area multiple times per week dropped, but that it increased by month and year. The study noted that this may have been because people were not coming as often after the parklet was installed or could indicate that the parklet is attracting new people who previously did not frequent the area. · Prior to the installation of the parklet the average number of blocks walked dropped from 7.5 to 6.5 with the maximum distance also decreasing from 20 to 15 blocks. The study noted that this difference may be due to fewer people coming from farther away, or because the parklet is attracting more people from the neighborhood nearby. · The study found a “slight increase” in user satisfaction in the area and an increased perception of community character. · Parklet provided needed bicycle and pedestrian facilities, but also increased the demand for them. The Pavement to Parks program is considered a success in San Francisco with approximately 60 parklets having been installed throughout the City since the program began in 2010. The program also includes the transformation of public spaces into pedestrian plazas, such as alleys. San Francisco recently expanded the program to include the “Urban Prototype Exchange”, which is a platform for connecting prototype innovators with communities who are interested in experimenting with new small scale projects in response to a lack of open space peak time bicycle parking demand, and event based activation such as portable bicycle corrals, portable parklets, and street stages. The Pavement to Parks program is well established and has 12 full time employees, including a manager, policy director, five project managers, a graphic designer, two communications employees, and two project assistants. However, other staff from Planning, Public Works, and Transportation participate through the proposal review, design review, permitting, public noticing, plan check, inspections, and site preparation (e, g, removal of meters). The program includes extensive design and operation standards, a citywide monitoring program, opportunity mapping to identify locations, and research. Guidelines issued by the Director of Public Works (see Attachment A) provides the foundation of the program guidelines for approval and installation. · The proposed Parklet site should be located at least one parking spot, approximately 20 feet in from a corner or protected by a bollard, sidewalk bulb-out, or other similar feature, if located at the corner. Exceptions may be considered on a case-by-case basis. · The proposed location should have a posted speed limit of 25 mph or less. Streets with higher speed limits may be considered on a case by case basis. · The proposed street has parking lanes that will not become a tow away lane during morning or afternoon peak hours. · The Parklet should provide a minimum clearance of 12” from the edge of any existing parking apron, where there is parallel, diagonal or perpendicular parking. · The Parklet shall be constructed and/or installed to conform to the applicable provisions, rules, regulations and guidelines of San Francisco Building Code (SFBC), the Americans with Disabilities Act (ADA), and the 2010 ADA Standards. For all ADA technical requirements, please refer to “Accessibility Elements for Parklets” Standards. · A minimum of 84-inches in height must remain clear of any obstructions along the Parklet’s path of travel, entry and accessibility areas on the Parklet. Obstructions may include but are not limited to tree branches and foliage, overhanging sign panels on posts, and/or the applicant’s addition of architectural elements to the Parklet. · The cross slope on the parklet surface may not exceed 2.0% in any direction. · The proposed street should not have a grade greater than 5.0%. On a case-by-case basis, a Parklet may be proposed on a street grade greater than 5.0%; however additional design requirements and review will be required to make the Parklet accessible for the public. See the Accessibility Elements for Parklets. · Abandoned driveway curb cuts, sidewalk defects, empty tree wells, or other sidewalk conditions at the Parklet location will need to be repaired and addressed as required with a DPW permit to ensure safe ingress and egress conditions. · Parklets shall be required to have soft hit posts and wheel stops. · If the Parklet deck is constructed with concrete, the concrete specific weight shall be a maximum of 200 lbs. / square foot. · Parklets shall not be allowed in red or blue zones. · Parklets may replace yellow zones or motorcycle parking if there are appropriate adjacent locations for these zones to be relocated, and if the applicant is willing to pay additional fees for relocating these zones. · Parklets may be allowed in white and green zones if the business that originally requested the white and/or green zones agrees to re-purpose that curb area for use as a Parklet. · Parklet structures shall not be allowed over a manhole, public utility valve or other at-grade access point in the street or sidewalk. Because of the well-established program in San Francisco, staff has relied on the standards established by San Francisco to expedite a Main Street Pilot. For additional information on the San Francisco Parklet program application, review process, and standards see the San Francisco Parklet Manual which is provided here as Attachment B.
Parklets are generally funding fully by the operators, including design, construction, and maintenance. Operators in San Francisco and Chicago have used KickStarter campaigns to raise money to pay for the costs associated to the parklets. For example, Outlands Café (which is noted below as an example of costs) raised $10,724. Some parklets have been funded by residents of the neighborhood and area businesses with both monetary contributions and in-kind contributions such as plants, materials, and design services. In response to a specific request by the Main Street Business Improvement Association the City issued a Request for Applications on September 24, 2015 for two or more operators for two or more Parklets on Main Street between Pico Boulevard and Marine Street. Staff utilized the San Francisco program criteria and standards as a model for the Main Street Pilot. Staff requests that Council select the location and operators for this pilot program and to authorize the City Manager to begin negotiations with the applicants to operate the parklet, including terms related to maintenance and insurance, among other details. The pilot would be a public experiment with the Main Street community to temporarily test this new concept in the public realm. The parklet pilot is intended to test and evaluate the program for at least one year, but may end earlier if public safety issues arise. The parklet design would be temporary and easily reversible, should the pilot demonstrate the need for design changes. The Parklet Pilot Program is part of the City of Santa Monica’s overall vision, as outlined in the Land Use and Circulation Element (LUCE) for creating pedestrian friendly routes and pedestrian amenities. The LUCE reorients the City’s auto-oriented boulevards into inviting avenues with wider sidewalks, improved transit, distinctive architecture, landscaping, trees and planted medians, and neighborhood-friendly services; these changes will define a new sense of place that will attract local residents to shop, work, live, and play. Staff is recommending that the design and construction of the parklet be funded by the City to ensure an adequate level of control during the pilot. The parklet would be a basic design (i.e. “shell”) that the parklet operator could enhance with furniture, plants, art, and/or paint. The operator(s) that are selected would participate in the design phase of the shell. Operators would not be required to pay any fees for the design and construction of the parklet, unless enhancements to the base “shell” are requested by the operator during the design phase that go beyond the basic shell and that are approved by Public Works (see conceptual design below). The shell will be constructed to meet safety and accessibility standards such as Americans with Disabilities Act (ADA) compliance (e.g. barriers and a flush surface with the sidewalk). Once the locations are approved, the design and construction phase will be approximately six months, which is consistent with the length of time it takes in San Francisco to design and construct a parklet once permits have been issued. · Maintenance: Keeping the parklet free of debris, grime, and graffiti at all times, and keeping all plants in good health. Emptying trash cans regularly so they are in available during all hours of parklet operation. An operator must maintain the surface of the parklet daily and if applicable based on the design, clean out the area beneath the parklet at least once a week. An operator may be required to provide pest abatement beneath the parklet platform. · Moveable Furniture: Operator will provide movable furniture for the parklet. Movable items, such as tables and chairs, must either be secured at night or taken inside. Unsecured furniture is not permitted after parklet hours, as established by the operator agreement. All tables and chairs must be different in make and model than what operator may already be using as part of its business (including sidewalk café tables and tables inside a restaurant/café). · Plants: The parklet will include planter boxes. Operator will provide plants. · Table Service: The parklet will be free and open to all members of the public to use. Table service at the parklet, including the placement of place settings, condiments, napkins is strictly prohibited. · Hours of Operation and Information: Operator would ensure that parklet is open during all posted hours of operation and is secured nightly at closing. Provide timely information to City staff about any concerns or public safety issues that arise. Track information about the parklet operations to inform any potential future parklet program. · Complaints: Operator would be required to remedy complaints, and correct issues identified as non-compliant with the operating agreement. · Insurance: Operator would be required, as part of its operator agreement, to maintain insurance. The City would also furnish the parklet with two signs that would identify the parklet as a public space, similar to the sign that is displayed on San Francisco parklets. 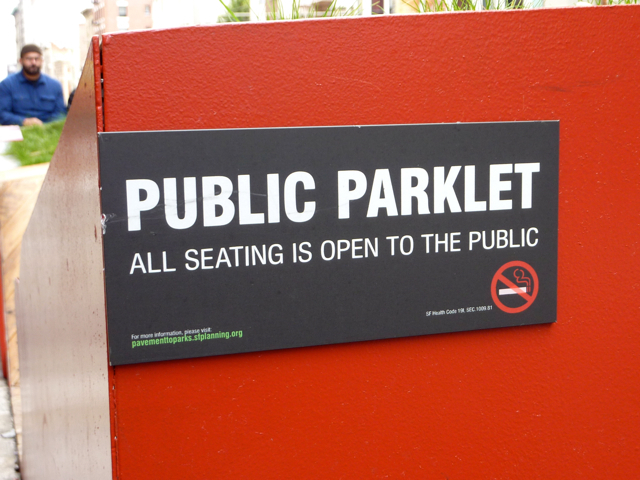 Below is an example of the sign displayed on parklets in San Francisco and Seattle. Although other cities charge permitting fees for parklets as part of their programs, staff is not currently recommending any application or permitting fees. These types of fees would be reviewed as part of the pilot. Staff is recommending a budget of $35,480 for each parklet based on two parking spaces for a total of $70,960 for the two parklets to be built. A line item budget is provided as Attachment I. Any design enhancements beyond this budget requested by, and approved by Public Works, will be paid for by the parklet operator. Staff will use existing budget for maintenance and as such is not requesting any budget for this at this time. The operator would pay for furniture, plants, and paint. Staff would include a request at midyear for the funding. Examples of parklets and the costs for design and construction obtained by Public Works staff (excluding permits) are provided as Attachment J. On September 24, 2015, staff issued a Request for Applications (RFA) for two or more Parklet operators. The RFA aimed to identify locations and an operator with a stated vision that fit with goals for providing an active public space. The RFA was posted on the City’s website at the Main Street Parklet Pilot webpage. An email was sent by the Main Street Business Improvement Association to Main Street business. Staff mailed a post card to all businesses in the Main Street area, issued a press release, and utilized other social media outlets. A selection committee comprised of staff from Public Works, Housing and Economic Development, Traffic Engineering, Planning and Community Development evaluated the proposals. The location proposed by Bike Attack at 2400 Main Street did not meet the location requirements as proposed curb space are red zones. Staff recommends Holy Guacamole, LLC and One Red, LLC (dba Wild Flour also Ashland HiIl) as the two operators best suited to fulfill the vision of parklet as a public space. Holy Guacamole is a restaurant located at 2906 Main Street. The owners of the business is Joe Pipersky who is actively involved in the Main Street Business Improvement Association. The applicant has proposed to operate the parklet during the normal business hours of the restaurant, 8:30 a.m. to 12:00 midnight Sunday through Wednesday, and 8:30 a.m. to 2:30 a.m. Thursday through Saturday. The applicant has described his vision to provide a “restful and appealing space for pedestrians and bicyclists”. He has proposed bold ideas for the design of parklet, but has also demonstrated a willingness to work with the City on achieving a successful design for the Main Street community. Ashland Hill is a restaurant located at 2807 Main Street. Ashland Hill is part of the FNA Hospitality Group which includes other restaurants in Santa Monica, including OP Café on Ocean Park Blvd, Art’s Table on Montana Avenue, and Ox and Son on Montana Avenue. The founder is Mark Verge who launched Westside Rentals in Santa Monica in 1996. The applicant has proposed to operate 11:00 a.m. to 10:00 p.m. Sunday through Thursday, and 11:00 a.m. to Midnight Friday and Saturday. The applicants have described their interest in operating a parklet to promote biking and walking in Santa Monica and to further its core values of “community, inclusiveness, life at the beach…green transportation”. The applicant has stated in its proposal that they would like to incorporate bike racks with the parklet. Mr. Verge is a Santa Monica native and attended Santa Monica High School. · Outdoor dining is permitted in areas where restaurants or food services are otherwise permitted. · Alcohol service is generally not permitted. · All chairs, tables and umbrellas must be removed every day upon closing of the sidewalk service. · Outdoor Dining may only be conducted as an accessory use to a legally established restaurant or other eating and drinking establishment that is located on a contiguous adjacent parcel. · The hours of operation of the Outdoor Dining area are be limited to the hours of operation of the associated restaurant or other eating and drinking establishment. · Outdoor Dining that does not exceed two hundred square feet in area do not require additional parking. Outdoor Dining areas that exceed that size must comply with parking ratios established in Chapter 9.28 of the SMMC. During the review process for the pilot with the association’s board, staff did not consider including licensed outdoor dining for parklet operators because the stated purpose of a parklet is to create a public space. Creating an outdoor dining area for a restaurant or café could be seen as “privatization” of the space, limiting it to paying customers, similar to outdoor dining areas that are licensed through the City today. Although parklets serve as seating areas and dining areas for pedestrians, the stated goal for parklets going back to the very first parklet that was described above is to create public space in an area that is otherwise lacking of such public amenities. The National Association of Transportation Officials (NACTO) defines parklets as “public seating platforms that convert curbside parking spaces into vibrant community spaces.” Cities, including San Francisco, Los Angeles, New York, Chicago, and San Diego, have specifically banned table service and advertising in parklets which preserves these spaces for the public realm. However, even though parklets were originally conceived as public space, there are examples of cities that have allowed parklets to be used for private outdoor dining, such as Portland and Seattle. In the case of Seattle, their parklet program has two options. The public option is simply called a parklet and is the same as the parklets described earlier in this report, which is a public space open to all. However, a parklet in Seattle that has authorized private outdoor dining is called a “streatery” and allow restaurants and bars to provide table service and serve alcohol. The streatery program is currently a pilot that began in 2015. Businesses with existing parklets were allowed to apply to convert their approved parklet into a streatery. During the businesses listed hours of service, the streatery is available to the business for its exclusive use of their business’ customers. Any equipment they need for serving is required to stay within the footprint of the streatery and not extend into the sidewalk, adjacent parking spaces, or travel lanes. During other times of day, the streatery is required to be a public parklet open to everyone. Chairs, tables, heating elements, and weather protection can be left in the streatery and should be arranged in a way that’s inviting and usable to the public. Any equipment used for food or drink service must be removed from the streatery when your business is closed. Storage can be built into the streatery structure, but equipment like serving carts or trays are not allowed to be left out. Businesses are encouraged to move or detach any fencing during non-business hours to maximize access by the public into the streatery. In the case of Portland, their parklet program is called “street seats”. The program also has both a “public” and “private” option. The public version is the same as the parklets described earlier in this report, which is a public space open to all. The private version of a street seat allows restaurants and bars to extend outdoor seating into a parklet. Private Street Seats also require a Café Seating permit, and allow restaurants and bars to provide table service and serve alcohol. Staff seeks Council’s comment and input on balancing a call for more outdoor dining on Main Street as a private use and the intended goal of parklets to provide public space. The Main Street Business Improvement Association (MSBIA) has recommended approval of four parklet locations instead of two. In addition to the two locations that are recommended by staff, Holy Guacamole and Ashland Hill, MSBIA also recommends locations proposed by Finn McCool’s and Rawvolution. See letter from the MSBIA Board provided here as Attachment K.
· Execute the Operator Agreements. · Estimate costs based on location selected and proposed design. · Complete the design and construction of the parklet. · Develop and initiate a monitoring program for the parklets. There is no immediate financial impact or budget action as a result of the recommended action. Staff will return to Council is specific budget actions are required in the future. Staff anticipates that the Main Street Pilot program will result in a one-time cost totaling $70,960 in FY 2015-16. The appropriation will be included in the FY 2015-16 Midyear Budget for Council approval. Complete Streets is a policy that requires streets to be planned, designed operated, and maintained to enable safe, convenient and comfortable travel and access for users of all ages and abilities regardless of their mode of transportation. Complete Streets are intended to allow for safe travel by those walking, bicycling, driving automobiles, riding public transportation, or delivering goods. The National Complete Streets Coalition, founded in 2005 by a coalition of advocacy and trade groups, including AARP, the American Planning Association, and the American Society of Landscape Architects. The Coalition “promotes the development and implementation of policies and professional practices that ensure streets are safe for people of all ages and abilities, balance the needs of different modes, and support local land uses, economies, cultures, and natural environments. are safe for people of all ages and abilities, balance the needs of different modes, and support local land uses, economies, cultures, and natural environments.